Greetings UB, I have just arrived back from Europe with more information that I could possibly digest in the two weeks I was there, so I’ll do my best to break it down here. The purpose of my trip was to attend the Prague Quadrennial, the International Competitive Exhibition of Scenography, as well as participate in Six Acts, a collaboration of international students to produce a site specific performance within the City or Prague. For my Six Acts project I was working with a group of 20 students under the direction of Pavel Štourač, the director of Divadlo Continuo – a Czech based theatre troupe. 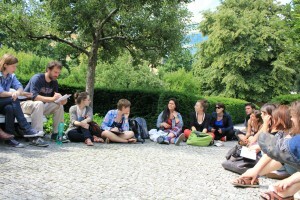 Our performance took place in the Franciscan Garden of Prague, on June 18th, and the first day we met was June 14th. On the morning of June 14th I was filled with excitement to meet my group mates, and discover the narrative of our performance. I was immediately surprised by how many people were part of our performance, 20 students, 1 director, and two assistant directors, and we all came from different places, Belgium, Serbia, Lithuania, Hong Kong, Portugal, United Kingdoms, Russia, United States, Canada, Germany, Poland, Czech Republic, and the Netherlands. Now putting together a show in 5 days is difficult no matter how you look at it, putting together a show in 5 days where there are over 20 people imputing their ideas and creations is even more difficult. There were 20 student scenographers, sitting in the garden, all with their own idea of how the performance could unfold, and Pavel listened to all of them. 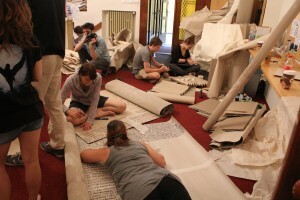 After we took in the performance site we moved to DAMU, Prague’s Academy of Performing Arts, where we had our own rehearsal hall that we turned into our workshop – and it was filled with paper. Everything we made for the performance was to be made out of paper, using bamboo for support when needed. Now don’t get me wrong – there were over 20 different types of paper, each with their own unique qualities, and we were able to make beautiful creations. 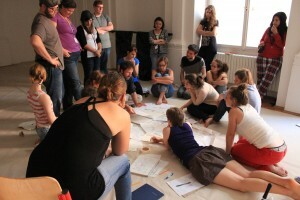 After relocating to our workshop, we immediately began creating from the various ideas we shared in groups of 4 or 5. After about one to two hours of working with the material and creating something we could reconvene for critique, where the group members would perform the gesture associated with that character or extension of the body. During the critique Pavel would work with the students to have them push their creation in a way that was not expected, or intended. He would work with movement and timing, and gesture, each time discovering something new about the creation and expanding the possibilities that object could have on the performance. For the next few days we worked like this. Everyone would express and create different ideas that related to the garden, Pavel would pick a handful to be created and we would critique. We were not writing a narrative, there was not a group of people labeled performers, nor a group labeled costume designers, lighting designers, etc. We were all working together, as a group to stimulate new ideas and possibilities, and working with paper. When the performance came nearer Pavel took time to narrow down which creations he wanted to see again, and what he hoped to use in the performance. Following this we had a session in which we each had to create a puppet. This specificity was interesting to me, as previously we were all working on a different type of prop. 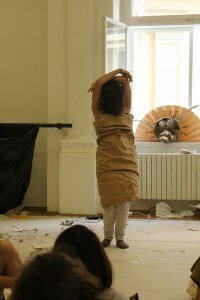 Making paper puppets became one of the most influential critiques of the whole week. We had paper bags, turned into faces before our eyes, and became animated as soon as they came into contact with the human body. It was just the magical moment we needed to move our production forward. On the day it was time to move back to the garden, we had a movement lesson. We cleaned the floor clear of all the paper debris that had been accumulating over the past few days, and began walking around barefoot. It started as an exercise in which we were to increase our awareness of others in movement, and try not to collide. Then we had to feel with our bodies, as we walked backwards, where there was movement behind us – in order to avoid colliding. Soon the exercise evolved into a type of game, where we began to group together, choosing to follow another, or mimic someone in the room, and then change course. This movement lesson primed us all for the performance that was to come. Making us aware of our body movement, and thus how our body would move differently in character. Back in the garden, we quickly began to make all the characters and puppets that Pavel wanted to use in the performance. We all worked together to get each one completed. Starting out mostly in groups based on which “scenes” we were in, and as the day went on, becoming a single unit, with everyone helping those in need as soon as another problem was solved. The scene I chose to focus my energy on was one that stemmed from the idea of a woman in a hat, whose hat then melted as she entered a fountain and would be covered in water. While this scene did not necessitate any difficult structures, or a large number of pieces, it posed a posed a problem with rehearsal. No matter how many hats I made each one would disintegrate in a different way. If I were to go back in time and start my construction process over again, I would have made at least 5 hats to rehearse with, as it was our time crunch only allowed me to make two. My character’s through-line developed as my designs developed. 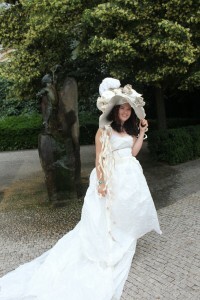 Starting with an elaborate paper hat, and then a white dress, which soon developed to have a longer and longer train. Before I knew it, my character was becoming a lone bride, one who was left in the garden. She turns to the nearby fountain to rid herself of the bridal costume, and the memory of her love. Walking away into the night (our performance started at 9pm). Each scene developed this way, extremely malleable, and in no way fixed to one idea. Some scenes were added or cut as needed. There was no strict guidelines to follow, it was a living creation. The performance developed into a series of vignettes, a choreographed site specific performance that traveled throughout the garden. Besides my water bride, there were monks, puppet heads, books, flowers, machines, birds, and embryos, all made out of paper. It proved to be a magical night, one that I will never forget. It was the first true collaborative process I was involved in, where everyone had a part in every step of the process, from the beginning to end, and it was also the first time I had worked with so many scenographers, all from different backgrounds bringing their ideas to the table. I was shocked at how over twenty different minds came together so perfectly to create something as beautiful as what happened in the garden that night. Audience members were brought into a another world of paper creatures, and moved through the space from scene to scene, discovering something new each time.